Home/Uncategorized/How do YOU feel about the proposed Rental Housing Licensing By-law? How do YOU feel about the proposed Rental Housing Licensing By-law? The City of Hamilton is developing a Rental Housing Unit By-law that would require all owners (landlords) of rental units ranging from six (6) units of less in a building to be licensed. A draft By-law will be presented and recommended to the Planning Committee. The purpose of this Bylaw is to ensure the health and safety of residents; maintain safe housing options within the City of Hamilton; protect property; and prevent public nuisances. Definition of a “rental housing unit” means a room or suite of rooms used or intended to be used by one or more persons living together as one household, in which cooking and sanitary facilities are provided for the exclusive use of the household, and to which an independent entrance is provided. A copy of the report will be available online atwww.hamilton.ca/licensing (under Things You Need To Know) or copies will be available to view at City Hall (Clerks), 71 Main Street East 2nd Floor. This kind of survery,should have done at the time Council deceided go along with weekly pick up with tags..etc .This undermined Staff ecommendation to go with Bi-weely pick up. Tax payers hughly benefited with Bi-weekly Garbage pick up to to help tax payers conserve. Question is,are we living in democracy? and Doesn’t respective consutency has the right express their view? I am 100% in favour of any by-law or piece of legislation that holds landowners and landlords accountable. I have seen first hand the results of deadbeat landlords and the effect their irresponsible rental practices can have on hardworking, tax paying citizens. The main issue over the years has been a lack of enforcement or action on the city’s part when complaints of absentee landlords, derelict properties, or nuisance tenants occur. My aging parents have had decades of problems with the clearly illegal rental home next door (vandalism, unkempt property, thefts), and have made countless complaints to the city with very little result. Normally the landlord is only in it for money and will rent to anyone with a deposit. Then when the city finally decides to step in and send notices, warnings, etc; the party sells, then its on to the next deadbeat. The city doesn’t seem to mind that the rental units don’t meet requirements (fire escapes, two points of egress, etc) as long as the property taxes are paid I guess. My main question/concern is in this regard. WILL there be enforcement of this by-law, sufficient to make it worth the resources it will take to implement it??!! If not, don’t waste anymore of OUR time and money! I am all for making sure rental units are safe for their occupants, and that no illegal units are being operated. On the other hand, who pays for this program? Landlords? Never. They will apply for, and most likely get, permission to increase their annual rent increase by an amount to cover this increase in their costs. It is my understanding that buildings with rental units already pay a higher tax mill rate than non-rental homes. If true, why can’t the money come from that bonus that the city already gets. People who rent get discriminated against. Helps keep us poor. are cheating them. Just how much money do you think a small landlord (6 units or less) make. With the costs rising every year (taxes, utilities, upkeep etc) and landlords sre allowed a .9% increase in rent- how do you think we prosper? Also we get screwed regularly by tenants not paying rent and leaving the apt. in shambles when we finally get them out, usually 6 months or more! Hitting small landlords with extra bills will force a lot of landlords out of the market and then the tenants will suffer. I am in full agreement with such a licensing By-law. I live in a heavy rental area, close to Mac, and believe that rental unit owners should be accountable for the state of their properties, many of which have deteriorated badly over the past decade. We need some oversight beyond what happening now, but let’s not punish the little guy. The inlaw suites, borders and basement apartments should be left alone. So it shouldn’t be less than six, it should be more than two. High/low rises need oversite as well. This bylaw as it’s written is not what’s needed here. One of my tenants who moved into a room I was renting decided he didnt want to pay his rent. It took me five months to get him out of the unit. Finally when I did get him out he left all of his belongings here. Upon cleaning the room I found evidence of drug abuse (crack pipes) underneath his futon. He then went to the city and complained to an alderman that I was operating without a licience ( I had 5 units). The city investagted myself and another residience that he had moved into (once again refusing to pay his rent). Now with no place to live, the city provided him with a residience at 181 Jackson St.He pays maybe 180 dollars out of his welfare check for rent. I was informed by the city that if I had more than three units rented, then I would need a lodging licience. I have had to evict two of my tenants to meet the requirements. My tenants are poor people on ODSP and welfare. Is the city going to immediatly be able to provide accomodation to these people like they did for the “crack head” that I evicted? They are good people, and I treat them well. I haven’t raised the rent in five years because of their financial situations. In the course of several years the police have been at my residience twice. An indication of what truly goes on here. My neighbours are good people and have no ill feelings about my place being a rooming house. The profit that I do make off this residience is spent on upgrading and keeping the house in good shape. I live on site on the ground floor. Perhaps the city should consider exempting Landlords who actually live on site as they are quite easily able to stay on top of things. A friend of mine has two properties and one of them is rented out to 5 students and is considered a single family dwelling and he doesn’t live there. How come he is exempt from meeting the requirements of a lodging house? We sympathize with Patrick Siriann (see above) as we have experienced bad tenants. We would love to have access to a listing containing the names of the so called “professional tenants”. Perhaps, the Hamilton and District Apartment Association would be interested in such an important undertaking then our five(5) “professionals” would not have a chance to rip off other landlords. We agree that licensing is needed for “illegal conversions”. However, we are opposed to lumping legal rental units of < 6 under this proposed rental licensing. Why should legal landlords be required to have to pay for a rental license? We small apartment landlords are just breaking even with costs. Any additional costs will, definitely, be passed to the tenants. Our tenants consider us to be good, responsive landlords. Therefore, why should they be charged additional costs that they don't want or need? I suppose there are good landlords and bad in the city, but I don’t think anyone should be fooled into thinking that this is about health and safety of tenants. This is a cash grab by City Hall. The cost will get passed on to the tenants, or possibly drive people out of the landlord business. Why not make it for landlords who have 10 or 20 units. Those multi-millionaires have the cash to spare, not the little guy who is renting out his attic to try to make ends meet. I suggest that tenants be required to take a course in dish-washing, vacuuming, floor washing, laundry, cooking, garbage disposal, etc etc. Once they have passed the course, They would be issued a licence to be able to rent. That way descent Landlords would have one less worry. The “Tenant Protection Agency” or LTB needs to be abolished. (or severely overhauled.) There is no justice there for Landlords with Bad Tenants. The whole process is an unjust Joke! All it does is empowers bad tenants to continue in their malicious, destructive behaviors. No wonder Landlords give up. Whats the use of providing a descent rental unit when the tenants are not held responsible for any damages? There are Tenants who cause $3000 to $5000 worth of damage withing a year, and just move on to the next place, after the LTB deems it all to be constant with normal wear and tear. Regulators should be looking for ways to help and support Landlords so they can provide decent rentals and also ensure that they have some protection for their investments. There are enough regulations in place that would take care of the “Slumlords” if only they were enforced. This bylaw follows on the waterloo bylaw. Waterloo is being devastated by big ugly multi unit student residences. The impediment to more of the same is the small landlord renting out part of their homes. Getting the small landlord to move provides more land for development. 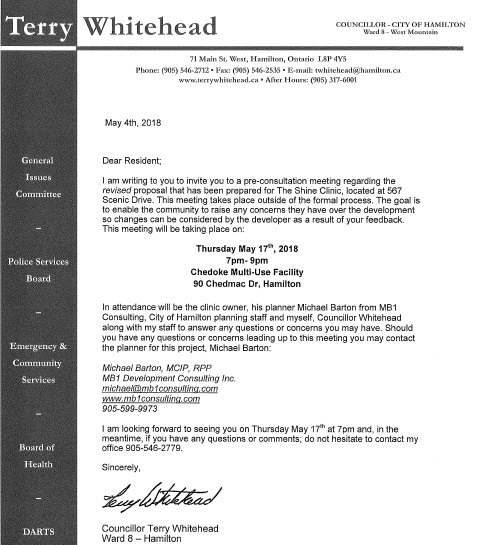 The Waterloo bylaw is part of the push to move the residential component away from the area. Making it more difficult for small land owners to afford living there is part of the motivation of this bylaw. Their bylaw specifically attacks ancillary units in owner occupied homes. 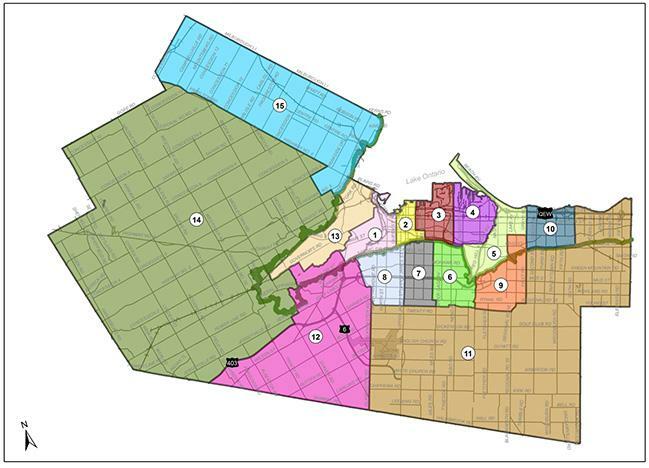 I do not want this ugly bylaw to come to Hamilton. The city cannot enforce it’s bylaws on big ugly residential units such as the monstrosity opposite Dundurn castle. Those buildings are an eyesore on entry to the city and a blight visible by any tourist to the Castle and our city. 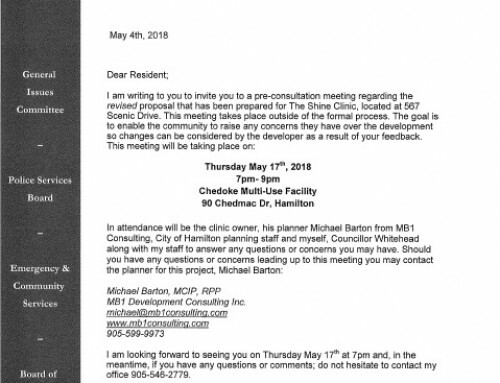 Why would Hamilton think it can enforce bylaws on the new development that will occur near the University and College when you drive the owner landlords out. You let the big guys go free and attack the small ones just because you can. It is horrible. Monster homes have been build near the university. They all still exist. The big unit suites in Waterloo and to some extent in Hamilton use rental agreements that contain illegal covenants. No enforcement is done to protect tenants from these issues. If you are going to increase costs on small then provide some balance to maintain options for tenants and review the leases. No tenant has to sign a new lease or move out when the old one runs out… they continue on the same terms on a month basis. Sure I understand you don’t have jurisdiction to look at those issues but you should understand why you are only allowed to attack the small guy. The entire city paid to have the West Village Suites provided with occupancy permits when they broke the rules and were not ready in time. They built closer to the road than they told the residents they would. 1686 Main Street West. Is this the future you want from this bylaw – promoting big ugly over small residential units. This bylaw is not the means to the desired end. It is a mechanism to increase costs on small landlords through a full recovery plan. You have always had the right to enforce standards, you don’t need licensing.